I started writing this review by looking for my thoughts on MJ Rose’s The Reincarnationist. To my surprise, I never did one. I remember liking the book, and then cracking the spine on The Memorist a day or so after I finished The Reincarnationist. I vaguely remember I read both these books over a week. I enjoyed both, but really liked the first book better. The one thing I really like about MJ Rose’s The Reincarnationist series is the historical references to places, people, archeology and art. In my opinion, these references are exactly what makes being loyal to this series a borderline must. Rose does a phenomenal amount of research and ties in the idea of reincarnation in an exemplary manner. She has an excellent ability to describe a place or work of art or an atmosphere that allows a reader to insert themselves into the story. Upon completion of these books, whether read back to back or separately, I have spent additional time pondering both the settings and the concept of reincarnation – for weeks after a reading actually. This is the draw of these books, for me at least. Its not the actual plot line, or the characters, its the idea that maybe I did once spend a life in Ancient Greece or Persia, or maybe I was someone who helped build Stonehenge or an early American colonist. After I finished The Hypnotist, I went back and read The Reincarnationist (I’ve actually read this book a few times). I maintain the first book in this series is the best – I liked the settings better. Many others have written reviews stating that even though these three books are a series, they can be read as stand-alone. I truly just don’t agree with this assessment. If you read either The Memorist or The Hypnotist without having read The Reincarnationist, you will not have a good grasp for what the Phoenix Foundation is and what ‘they’ do. I suppose you could read The Hypnotist or The Memorist by itself, but I believe if you do, you’ll have to endure several instances of confusion because each book builds the role of the Phoenix Foundation in the story line. I think The Hypnotist may be the most confusing if you’ve read neither The Reincarnationist or The Memorist. Just a quick touch on The Memorist. 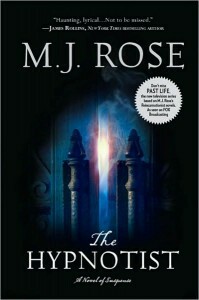 I found MJ Rose as the winner of a contest on the Ravenous Reader’s book review site, Bookstack. The prize was both the first and second book in the series. After finishing The Reincarnationist, I couldn’t wait to crack open the Memorist (I just went back and found reference to this occasion). The Memorist may actually have been better written than The Reincarnationist. The concept of a magical instrument was fascinating and may actually have been better written than The Reincarnationist in regards to concept of sound being a catalyst for remembering a past life. Did I like The Hypnotist? I don’t know. I don’t think it measured up to the other two books. If I’m being honest with myself, it was not a bit too predictable…it was VERY predictable. The plot line was different, but if you’d read the other two books, you knew where the conflict was going to be, you know who the antagonist was, and you knew there were probably multiple past lives and what the protagonist had to do to set the world right. I sort of felt like the story was rushed…maybe? I just didn’t get the same historical engagement as I did from the other two books. I thought the protagonist was a little flat and the antagonist tired. Though I found these things to be challenging, I thought the concept was thought-provoking and the writing was engaging. The Reincarnationist series, as a whole, would be worth the reading time for those interested in the possibilities of reincarnation and/or historical fiction. I do not believe The Memorist and The Hypnotist should be read without having read The Reincarnationist. That said, to ensure less confusion in the subsequent books, I truly think this series should be read in order. I’d like to thank the publisher and Pump Up Your Book for giving me the opportunity to participate in the virtual book tour.